Saute white onion in olive oil until no longer translucent. Add 2 cloves garlic and saute 1 min longer. Add risotto rice and toast for about 3 min. Add white wine and cook until absorbed. Slowly add chicken stock, stirring occasionally until fully absorbed and rice is tender to bite (al dente). While stock is absorbing melt butter in separate pan. Sautee green onions and 2 cloves garlic for 1 minute and add geoduck. Saute over medium heat, stirring occasionally, until siphon meat is tender, about 10 min. When risotto is ready, pour contents of geoduck pan into the risotto and stir to mix. Reduce heat to low and add Parmesan, stirring to melt. Serve. Ashley’s Recommendations: I came up with this one myself! Great reheated for lunch. Ashley’s Recommendations: Use low sodium chicken stock for healthier, less salty chowder. In a large saucepan or soup pot, combine rice and stock or water and bring to a boil. Watch carefully to avoid boiling over. Turn heat to low and simmer for 1 hour or until rice grains are soft and broken up. Allow to cool slightly then process in food processor or blender until smooth. Add more stock if soup is too thick and return to pot. Bring rice chowder to a boil, add miso paste and stir to mix well and season with salt and pepper to taste. Add ginger and cook for 1 minute to infuse flavors. Remove from heat, add geoduck slices and stir. Divide into bowls, garnish with a drizzle of sesame oil, a sprinkle of corn flakes and green onions and serve immediately. Ashley’s Recommendations: Can substitute different types of mushrooms or potatoes. Working over a bowl to catch the liquid, cut the geoduck out of its shell with a sharp knife. Cut out the soft belly and discard. Cut the siphon and body apart, and cut the body into 1/2 -inch dice. Weigh the body meat. Cut the siphon into half-inch slices, slicing only enough to make a total of 12 ounces siphon and body meat. Use the remainder of the siphon for sashimi. Place the thickly sliced siphon meat in a food processor and process until roughly chopped. Put all the geoduck meat in the refrigerator while you continue the recipe. 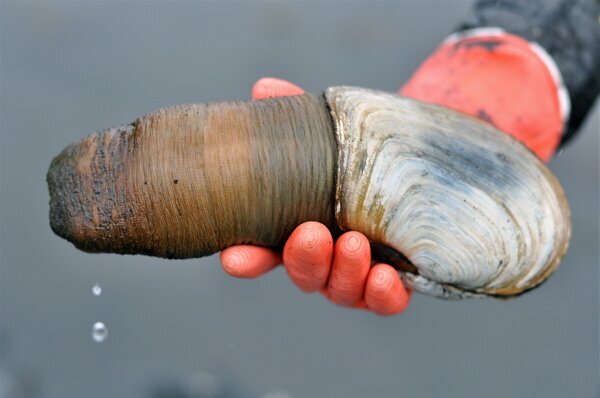 Strain the geoduck liquid into a 1-quart measuring cup. Add enough clam juice to total 4 cups of liquid and set aside. In a large pot, cook the bacon over medium heat until crisp. Add the 4 tablespoons butter, onion, celery root, thyme and bay leaves, and cook, stirring occasionally, until the vegetables are soft but not browned, about 8 minutes. Add the potatoes and the clam juice mixture and raise the heat to high. Bring to a boil and boil uncovered, stirring occasionally, until potatoes are tender and just beginning to break up, 8 to 10 minutes. Add the cream and reserved geoduck meat to the pot, season with pepper, and take it off the heat to rest for up to an hour. If you’re not serving the chowder within an hour, cool it to room temperature and put it in the refrigerator for up to two days. Reheat the chowder over low heat. While it’s heating, prepare the chanterelle garnish. Place a skillet over medium-high heat and add 1 tablespoon of butter. Saute the chanterelles, sprinkling with salt, until they’ve browned, about five minutes. Serve the chowder in heated bowls, garnished with the chanterelles, parsley, chives and toasted common crackers. Ashley’s Recommendations: Can use different types of seafood, in addition to or in place of squid. Soak the mushrooms in enough warm water to cover until softened. Drain, discard the stems and quarter the caps. Separate the squid tentacles from the bodies. Leave the tentacles whole. Cut the bodies open along one side so they lie flat on the cutting board and lightly score the inner side in a small crisscross pattern. Cut the scored pieces into 1 1/2- by 2-inch pieces. Bring a 2-quart saucepot of water to boil. Add the winter melon; cook until tender crisp, about 2 to 3 minutes. Remove with a slotted spoon. Blanch the clams and squid in the same water until the meat is opaque, about 30 seconds. In a 3-quart saucepot combine the stock, carrots, both mushrooms, peas, ham, wine, salt and pepper. Bring to a boil, cover, reduce heat to medium and simmer until the carrots are tender, about 4 minutes. Add the winter melon and seafood; cover and simmer until the seafood is cooked through, about 2 minutes. Ladle into the soup bowls. Ashley’s Recommendations: Even better with fresh herbs! Increase each to 2 tbsp when fresh. In a 5- to 6-quart pan over medium heat, combine bacon, sausage, and onion; stir often until well browned, 10 to 15 minutes. Spoon out and discard fat. Add to pan the celery, bell pepper, tomato, oregano, basil, thyme, and chowder base. Bring mixture to a boil (if made ahead, let cool, cover, and chill until next day; reheat to continue). Add geoduck, stir, and remove from heat immediately. Ladle chowder into bowls. Chowder base: Mix together 1/4 cup tomato paste, 1 bottle (8 oz.) clam juice, 1 can (12 oz.) tomato juice, and 1 1/2 cups chicken broth. Ashley’s Recommendations: Havarti cheese brings an interesting depth to this unique salad; excellent for summer! 1. Saute geoduck in butter. 3. When ready to serve, halve, pit, peel and slice avocado. Fan half an avocado on each plate and serve crab salad alongside. Does this “gooey duck” recipe sound tasty to you? Perhaps you have some ideas on how we could make it better? Please let us know what you think by leaving a comment below! Ashley’s Recommendations: Delicious over stir-fried noodles. 1. Place mushrooms in bowl with the boiling water to reconstitute, about 5 min. Strain through fine sieve or coffee filter, reserving liquid. 2. Remove stems and slice mushrooms. 3. 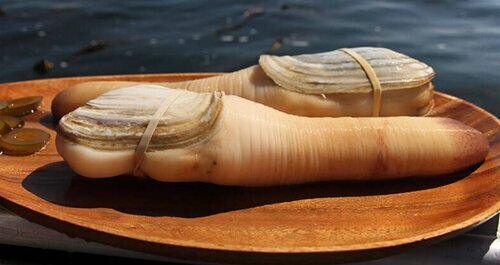 Clean geoduck and slice into bite sized pieces. Dredge in flour, and shake off extra. 4. Melt 1 tbsp in butter. Sear geoduck until golden brown, about 2 min. 5. Add mushrooms, spinach, soy sauce and sake and fry for another minute. 6. Remove all with slotted spoon and return pan to heat. 7. Add mushroom water and reduce slightly. 8. Whisk in remaining butter and add green onion. 9. Pour over geoduck and serve. Ashley’s Recommendations: Can add a pinch of chili powder for more kick! 2. Line a baking dish with paper towels and set aside. 3. Sift the flour, baking powder, salt, and pepper into a mixing bowl. 4. Add the clam juice, eggs, and milk and beat thoroughly with a wire whisk. Fold in the butter and geoduck. 5. Fill a large saucepan or wok halfway with vegetable oil and heat to 375 degrees. Very carefully, drop large spoonfuls of batter into the hot oil and 3 to 4 minutes, turning once, or until the fritters are golden brown on both sides. 6. Drain on paper towels, then transfer the fritters to the prepared baking sheet and place in the oven to keep warm. 7. Garnish with lemon wedges and serve immediately. Ashley’s Recommendations: Mushrooms are a great addition to this dish! 2. Saute geoduck lightly in olive oil with garlic and peppers. 3. Toss cooked pasta with olive oil and 2 tablespoons Parmesan cheese. 4. Serve pasta topped with geoduck. Ashley’s Recommendations: Wonderful for summer! 1. Combine onions, papaya and lime juice in a medium mixing bowl and gently mix well. 2. Add Geoduck, cilantro, jalapeno and mix well. Place in refrigerator for 30 minutes. 3. Just before serving, toss salad with oil and season with salt and pepper. 4. Place a portion of salad in the center of each plate, then top with a portion of the ceviche and serve. Ashley’s Recommendations: Can lessen fat content of this geoduck chowder by substituting half and half or milk, using cornstarch to thicken. 1. Grind geoduck in meat grinder until roughly chopped. 2. Melt butter over low heat in a large stockpot. Cook onions until soft. 3. Add geoduck and cook an additional 3 min, stirring occasionally to avoid browning. 4. Add clam juice and bring to a boil. 5. Add cream and return to a boil, then reduce to a simmer. 6. Add carrots, celery, and potato. Cook over medium-low heat until veggies are tender, about 10 min. 7. Make the Buerre Maine by mixing softened butter and flour together to form a paste. Press into a whisk and stir into soup until evenly dispersed. 8. Stir in remaining Ingredients, adjusting seasonings to taste.